Wednesday 21st of March 2018 and it was raining when I returned from Chaiyasit Muay Thai Gym where I had have a session of exercise with ปีศาจแดง ก.กุมานนท์, Red Devil. But it cleared up and me and my new Instagram birding friend decided to give it a go. 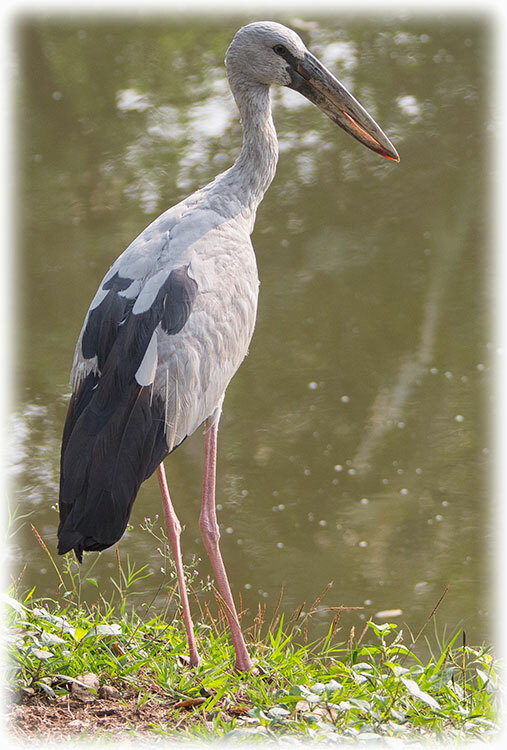 I took a taxi and I met my new birding friend behind the butterfly house, on the bicycle track next to the water. 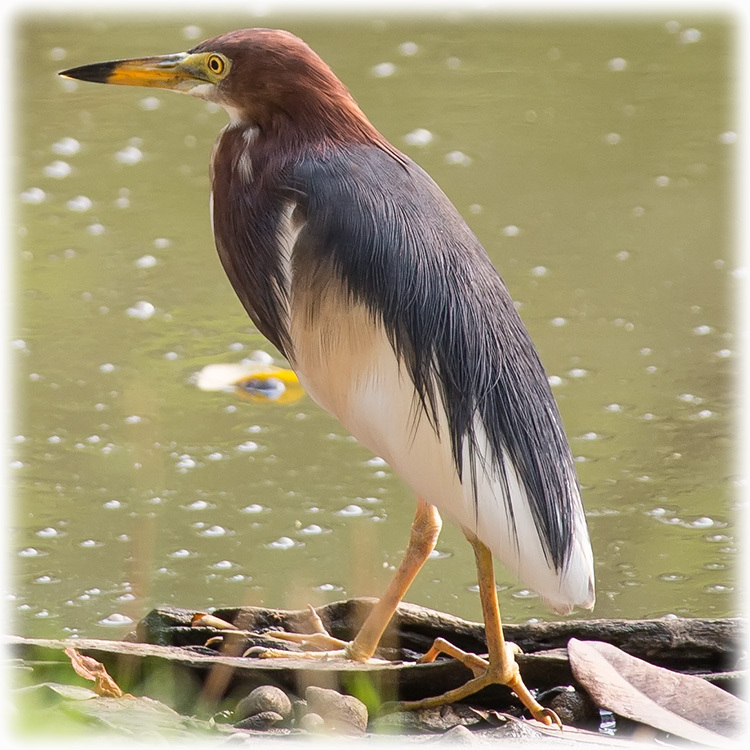 I ran in to a little Heron while waiting. 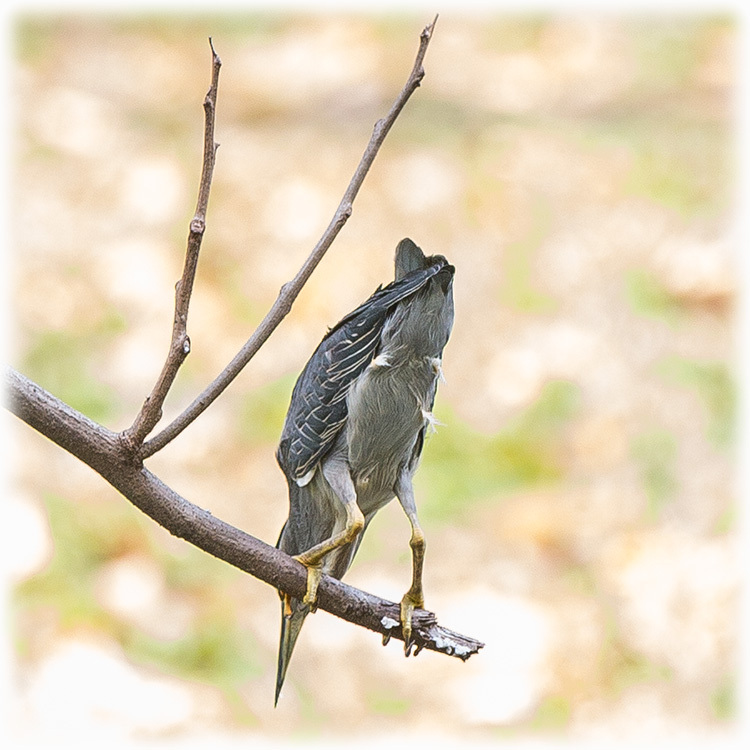 I spotted the bird just because of the movement, and I was not even sure it was a bird until I came very close, could have been a leaf as well. Me new friend came and he was carrying a tripod, a Canon house and the Canon 400mm 2.8. The exact same lens I had been thinking of buying. 4 kg and 10 000 US Dollars and when I saw him carry the tripod (A must for this lens) and the lens I decided not to buy it. You are not exactly “mobile” carrying all this stuff around. But you get good pictures from a distance while I have to sneak up close to the bird. We spotted a Blue-capped Kingfisher but no picture, too far away for me and by the time my new birding friend had set up his equipment the bird was gone. 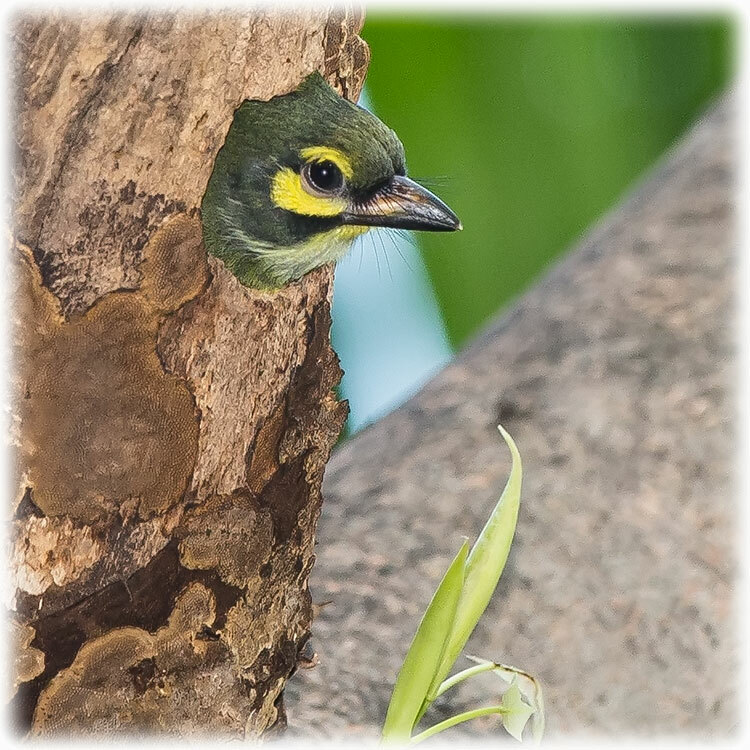 We crossed the bridge to Queen Sirikit Park and he showed me a Coppersmith Barbet nest and the parents were busy feeding the baby. 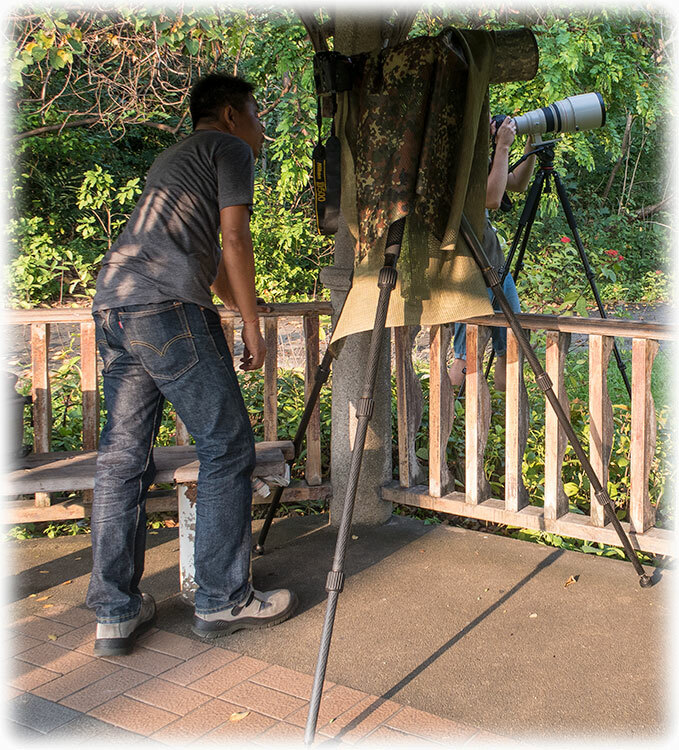 He had seen my picture of the owlet that I took last time in Suan Rot Fai and as he had never seen the owlet we went to the “owlet” area of Suan Rot Fai. I see owlets here almost every time. 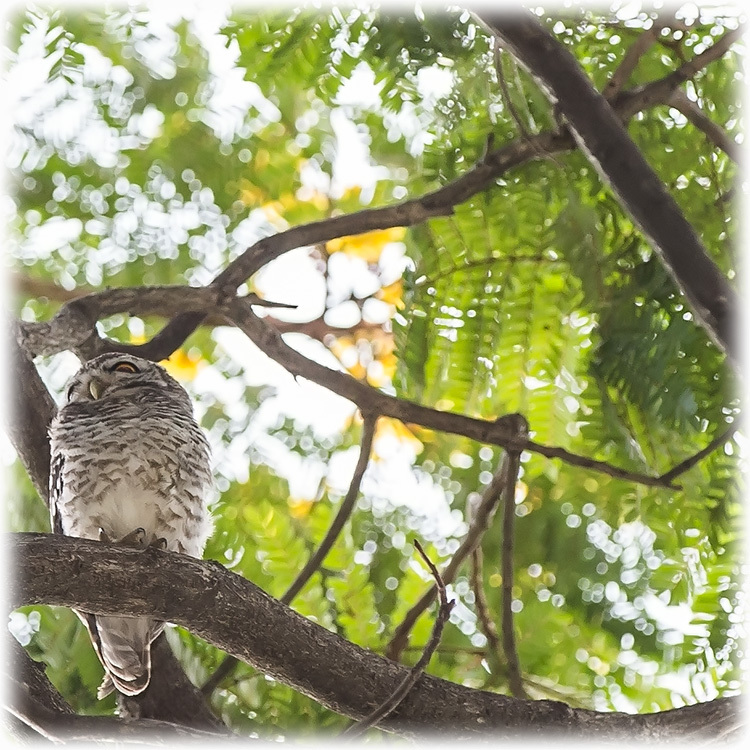 But strange, I have never seen any owlets in any other part of Suan Rot Fai. 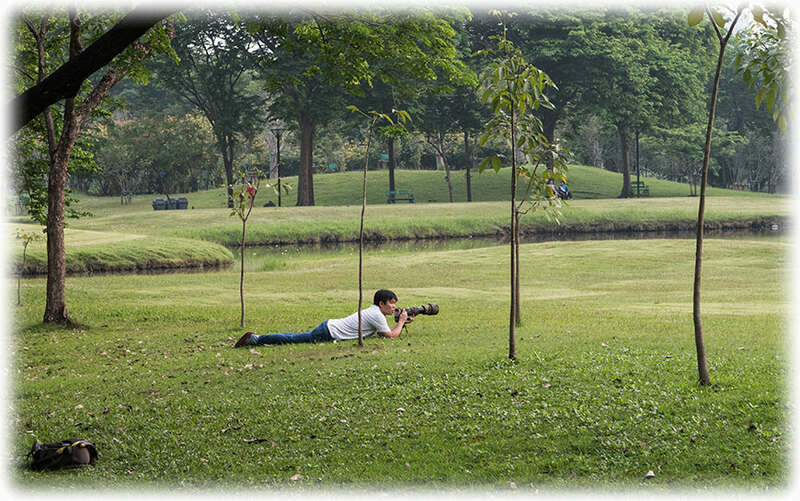 We see another guy with a camera pointing up another tree. He have also seen an owl. So we swap owl, I show him where the Spotted Owlet was and I walked over to the other owl. 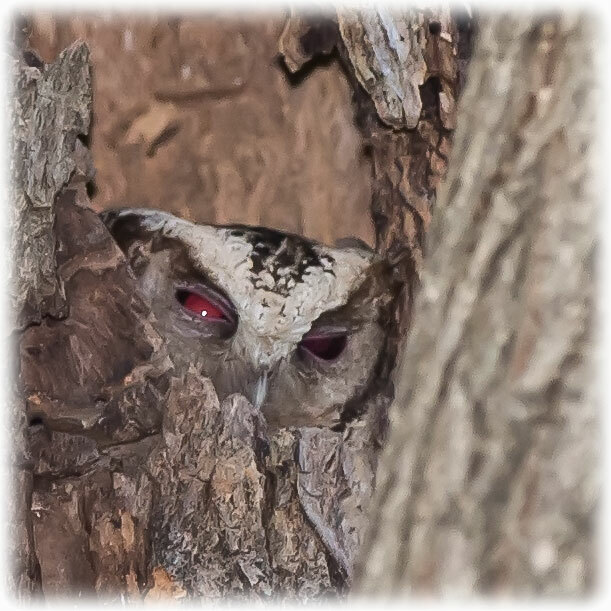 Looking like a Scops Owl, but the owl was in a hole so I could only see the top of the head. We waited to see if the owl would show more of the body. But no, the owl stayed in the hole and I could not identify the owl. 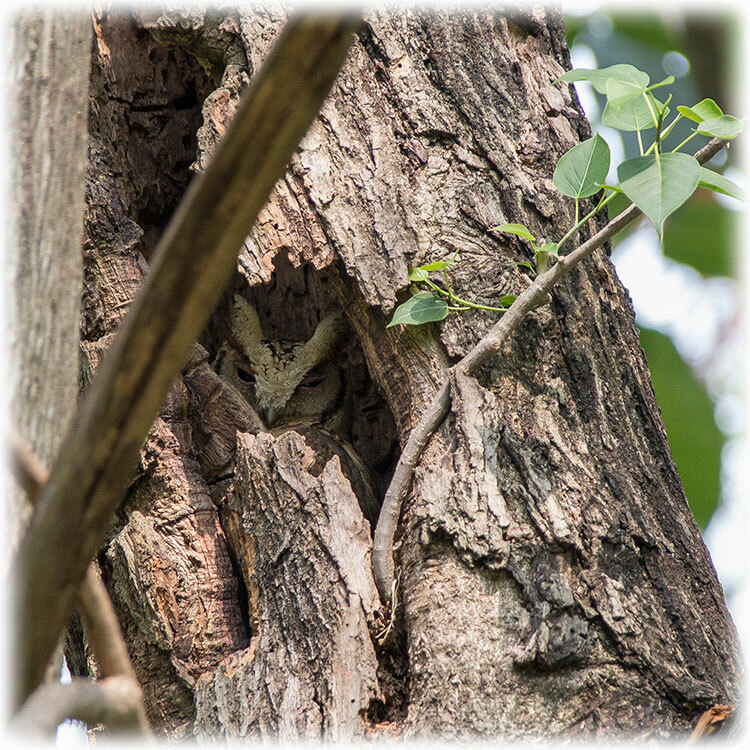 Most likely a Scops owl. 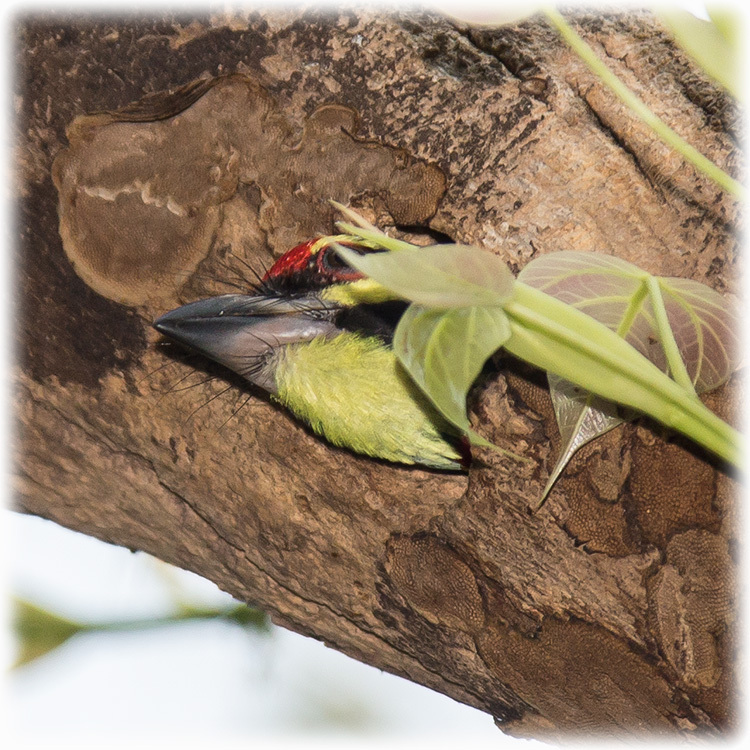 We left the owl and we walked back to see if there was any action in the Coppersmith Barbet nest. I will come back here tomorrow morning to check out the owl again. 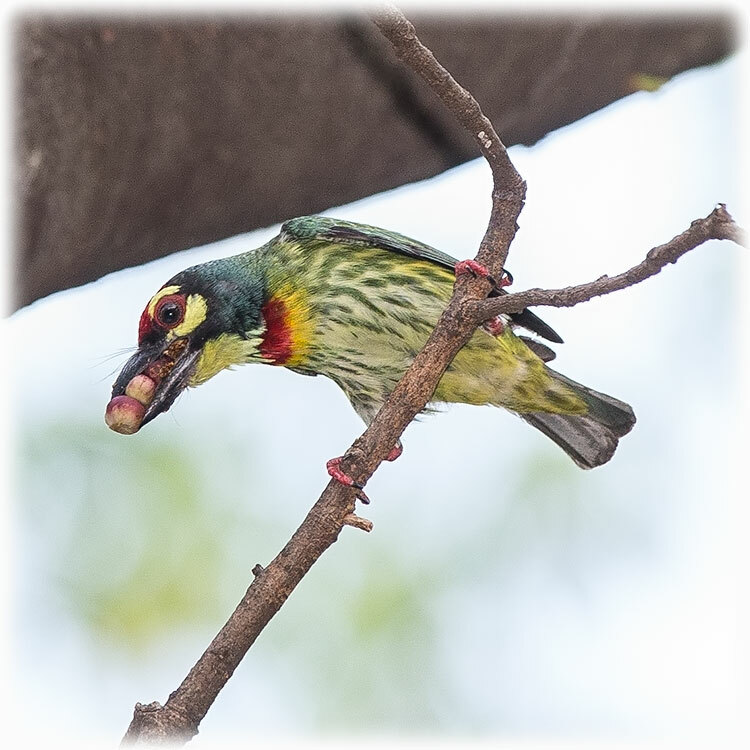 There was plenty action at the Coppersmith Barbet nest, yet another place I will have to check out tomorrow morning. 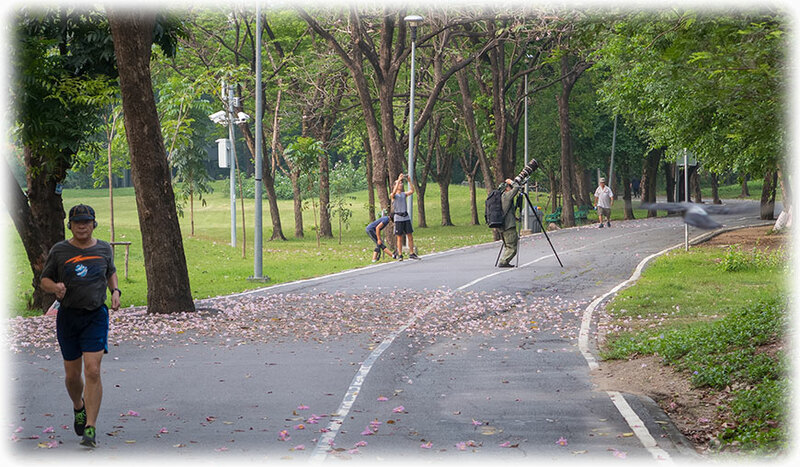 We continued in to Queen Sirikit Park and we spotted another bird watcher with a huge lens pointing in to a tree. 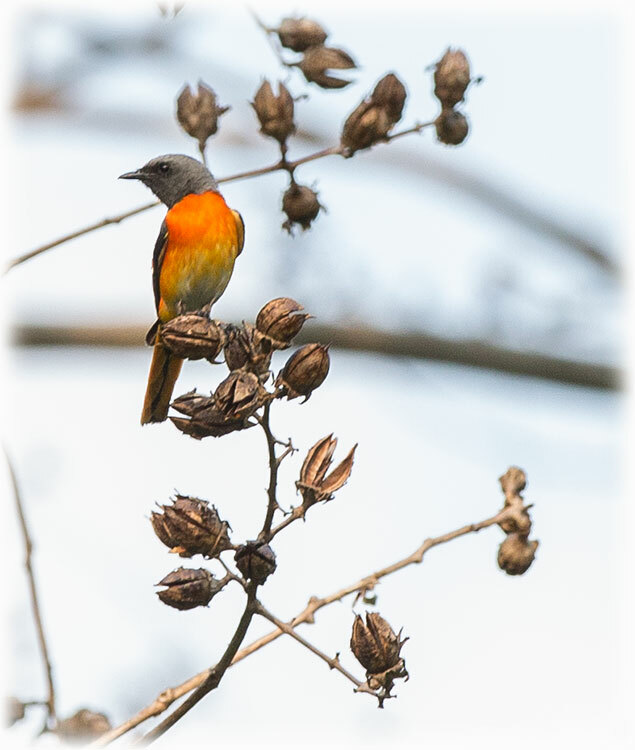 There was a Small Minivet in a nest and we discovered several Small Minivets flying between the tree and another tree and it looked like they were picking fruits. I didn't wanted to disturb the bird as the other bird watcher was here first. 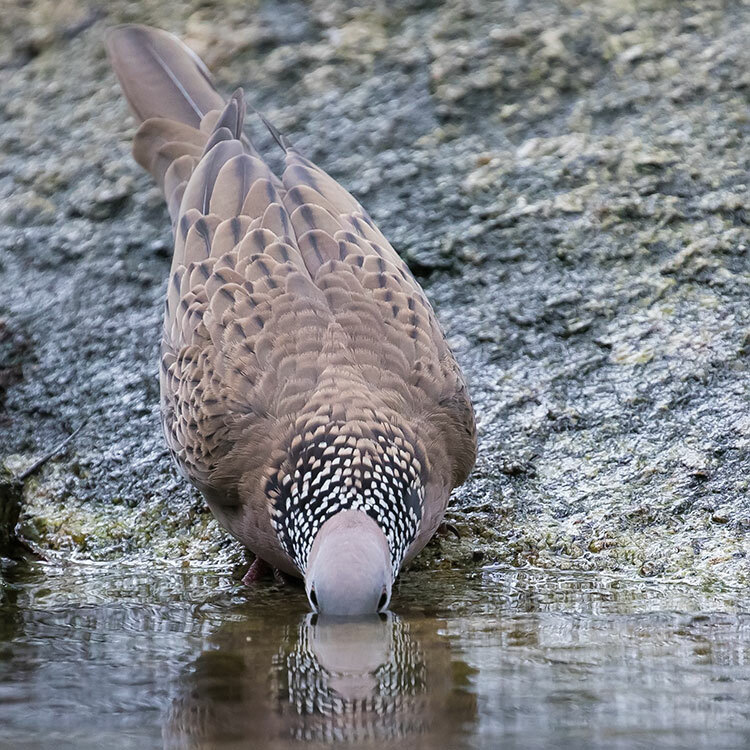 But I will try to come closer to the bird tomorrow when I'm alone and I will hopefully get better pictures of the beautiful Small Minivets. We left and we went to check out the Wave, the bird hide/ bridge. But now it was starting to get dark. 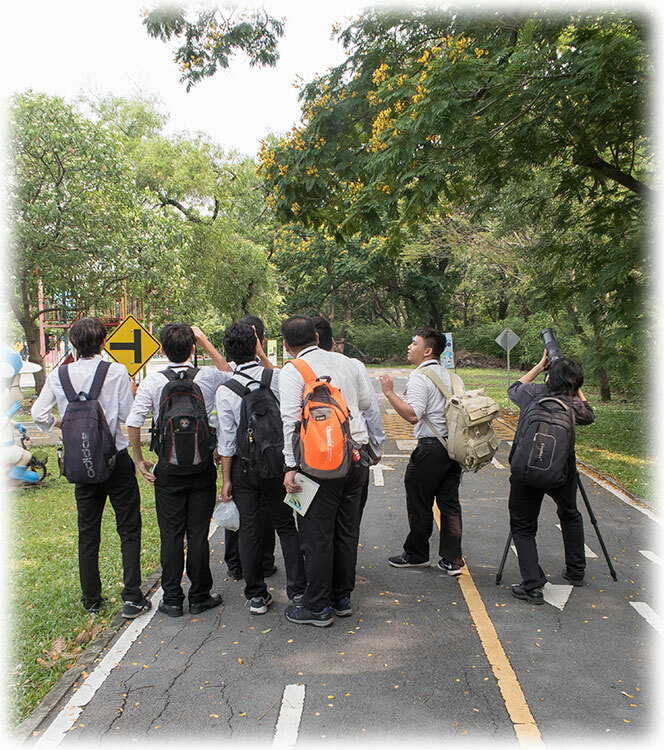 And we could not see any birds anyway and we went back in to Queen Sirikit Park. We spotted a group of Starlings and I took the chance to get a recording. 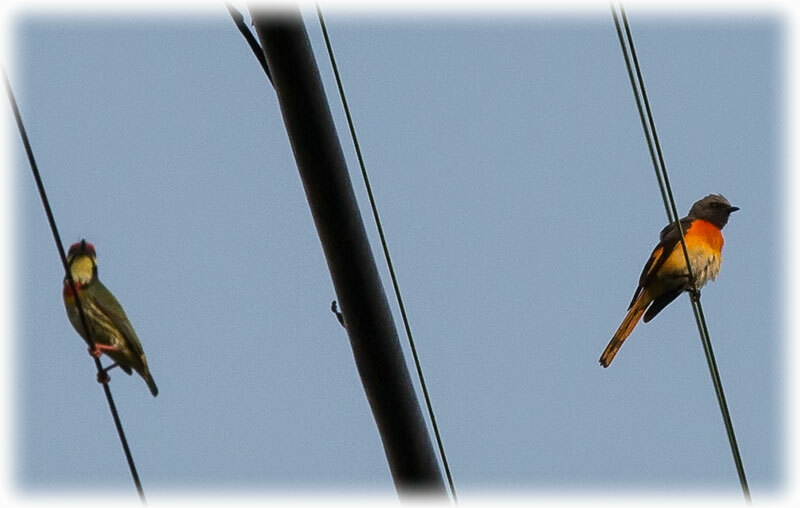 I tried with the Plaintive Cuckoo before, but the bird turned silent when I started the recording. But the starlings went on and on so I could get the song. Of course, when I listen to the recording I realise that I might need some practice with my new machine. Thursday 22nd of March 2018 and my alarm went off at 4. But I didn't get out of bed until 7. Back in bed at 8 and I slept until 10 o'clock. Back in bed 15 minutes later and it was almost 12 when I was out of bed again. I was obviously in need of sleep. I have been up 4 in the morning every day for the last month and flying home from India and there was no opportunity for any sleep. 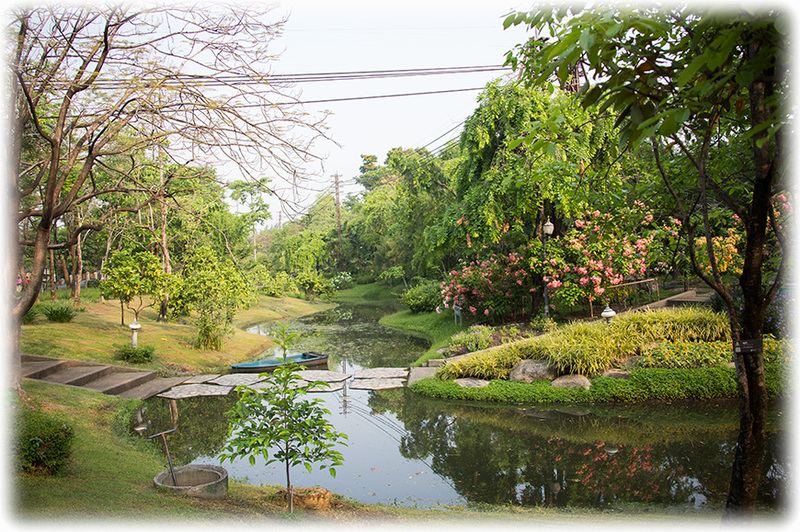 I will go to Suan Rot Fai tomorrow instead. Friday 23rd of March 2018 and today I was out of bed at 4. Tea and oatmeal and I left at 6 o'clock arriving in Suan Rot Fai 6 forty-five. 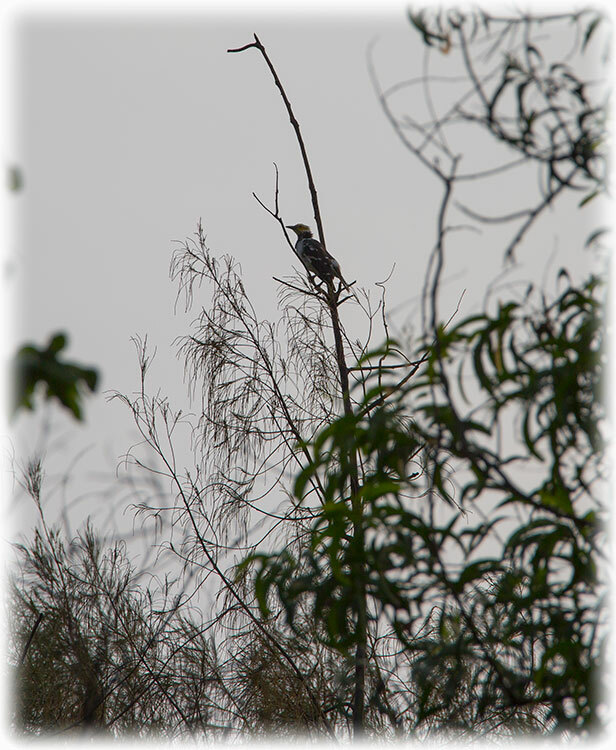 Walking my ordinary way and I spotted a Black-capped Kingfisher where we had seen it Wednesday afternoon. Coming to the bridge crossing the water to the Queen Sirikit Park. 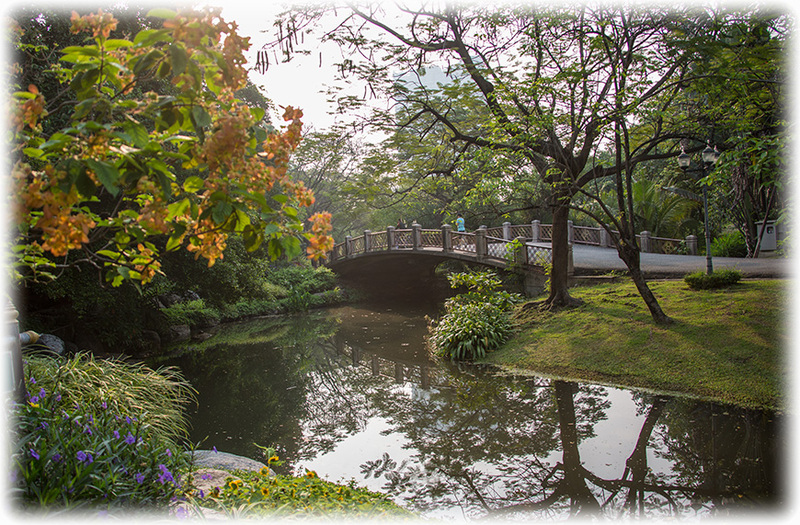 Turning to left and I end up in Queen Sirikit Park. But I turn right as I always do and I walk down to the “traffic school” to see if there is any Kingfishers and Owlets. Already approaching and I see a guy with a big lens on a tripod pointing up one of the trees. I didn't want to disturb him, as I use to say: It is his bird. 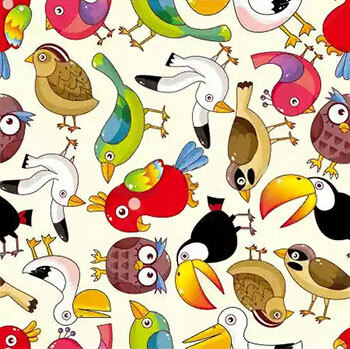 If I have found a bird I would not be happy if someone came to disturb the bird. 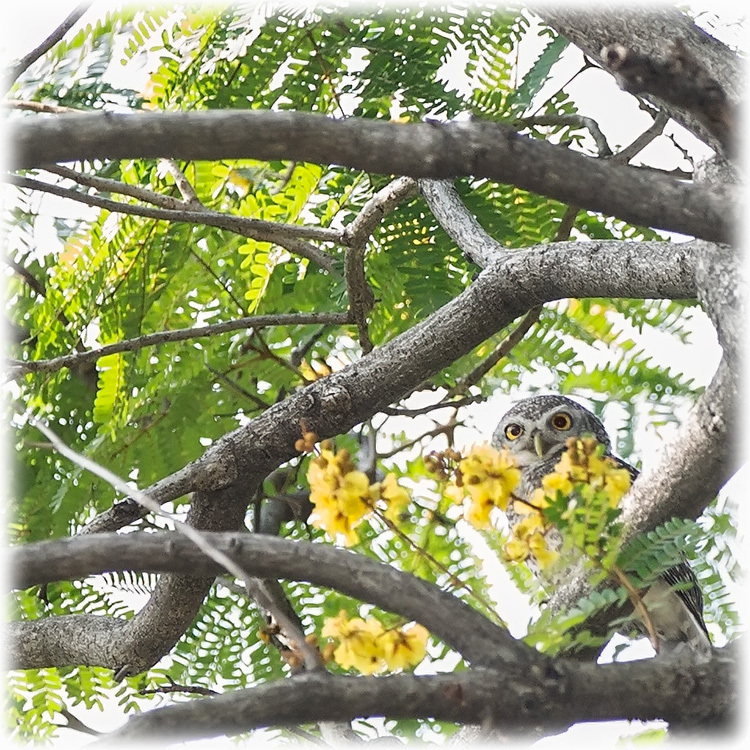 So I just walk by but I see the Collared Scops-owl in the tree. 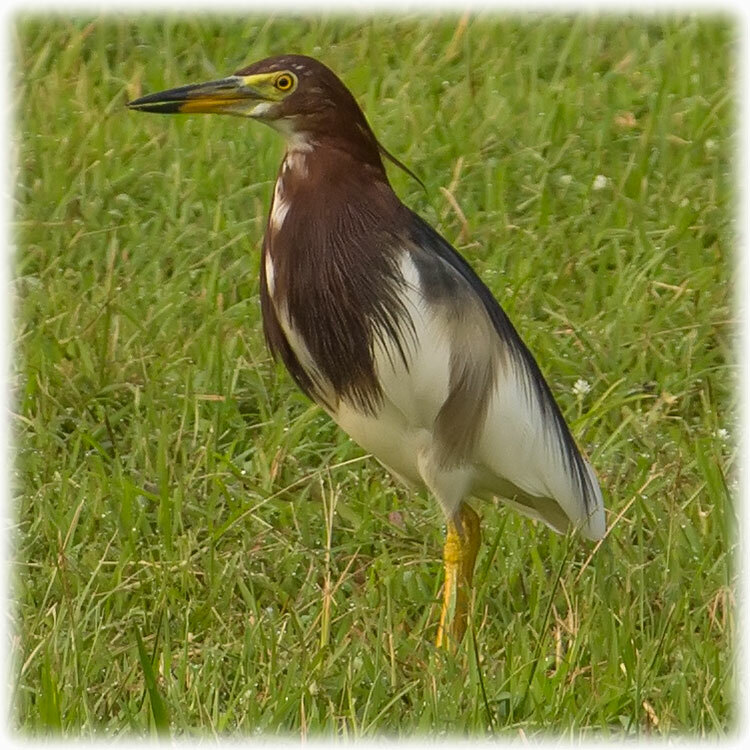 I continue out on the lawn as I want to have a picture of the Chinese Pond Heron. They are very scared so it is next to impossible to get a picture. I continue to the “hole” in the tree to see if I can see the owl from last Wednesday. 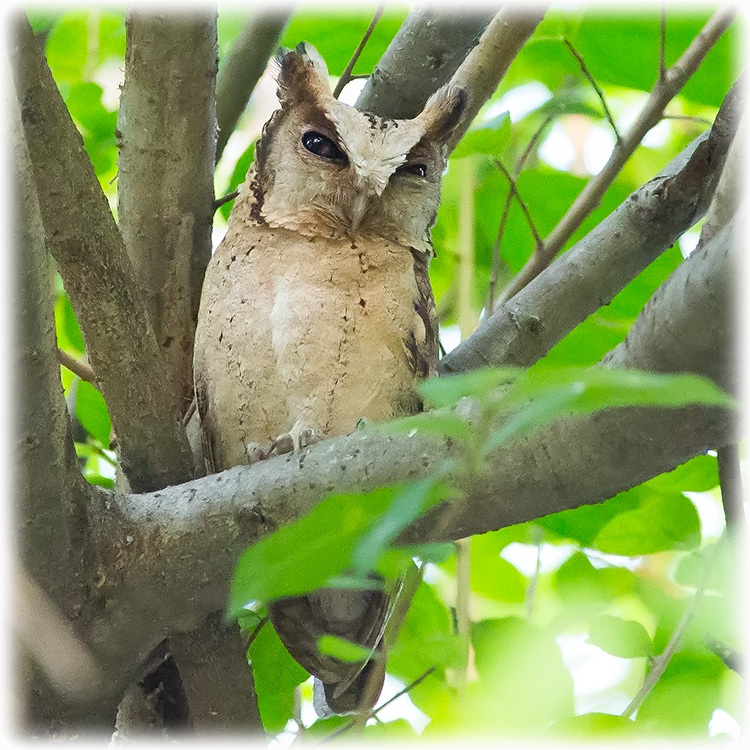 But the hole was empty and I suspected that it was the Collared Scops-owl in the tree. The bird watcher is packing up his stuff and I went over to him. He had to go to work and he had to give up the morning birding. 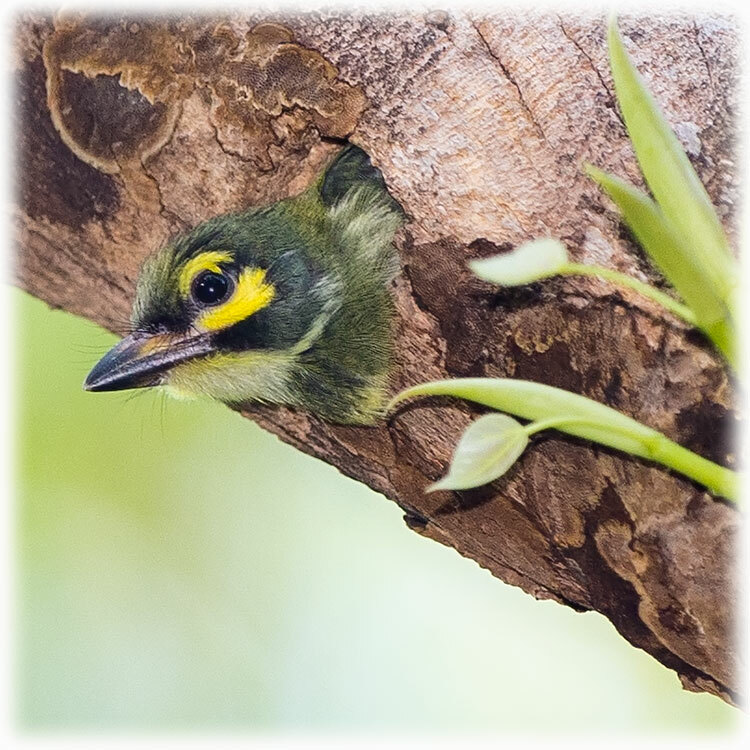 It was a beautiful owl and I got a few pictures and I started to walk back towards the Coppersmith Barbet nest in Queen Sirikit Park. 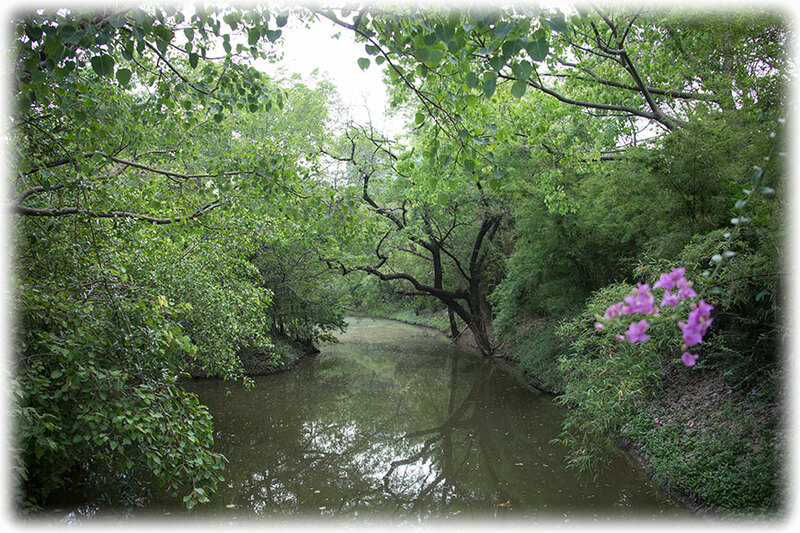 Approaching the bridge and I have a Black-collared Starling singing for me. 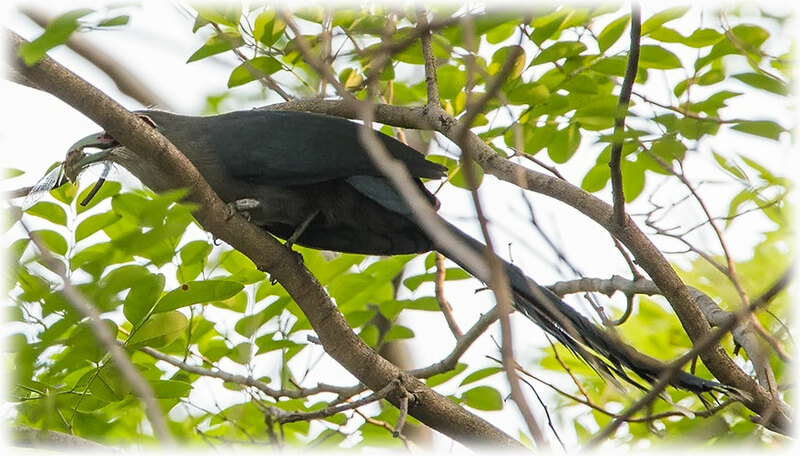 Crossing the bridge, or just about to cross the bridge to Queen Sirikit Park and I spotted the Green-billed Malkoha. 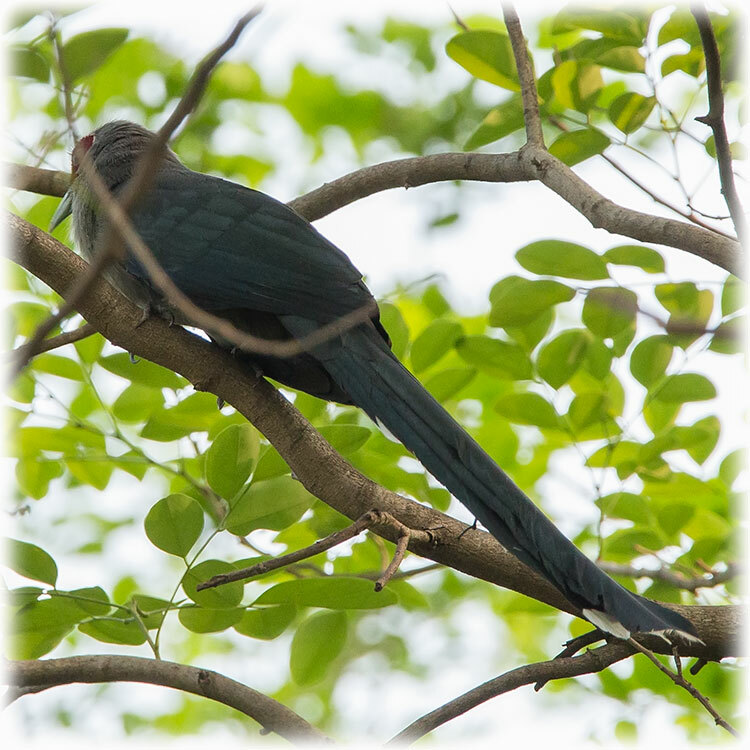 Darn, the Green-billed Malkoha was hard to get on picture jumping around. But I got a very bad picture of the bird catching an insect. 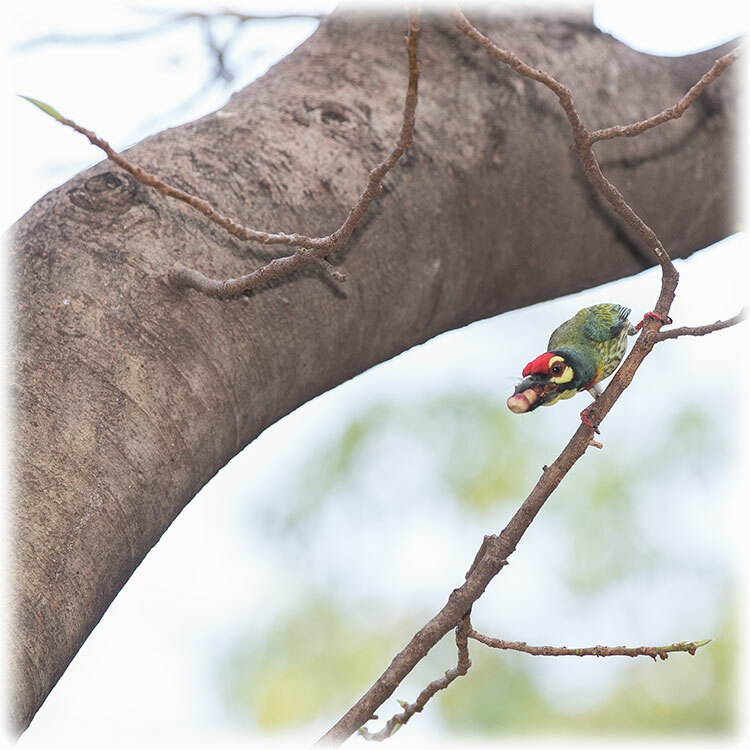 The Coppersmith Barbet baby has left the nest and there was no action at all. 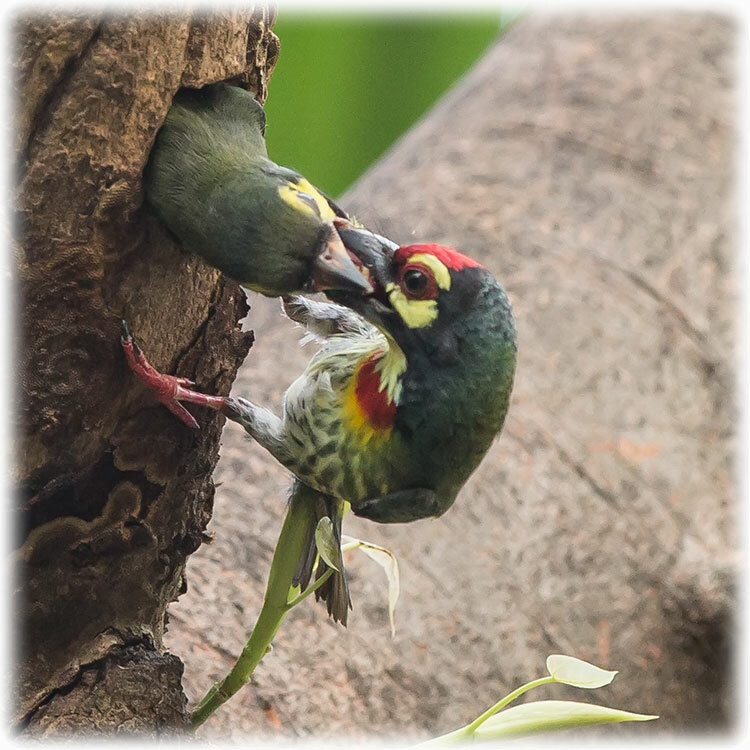 Already last Wednesday we could see that the baby was ready to leave the nest sticking out half the body, and eating the giant meal the parents brought home. I walked down to the bridge/ bird hide and I stopped to look for the Small Minivets but no luck. 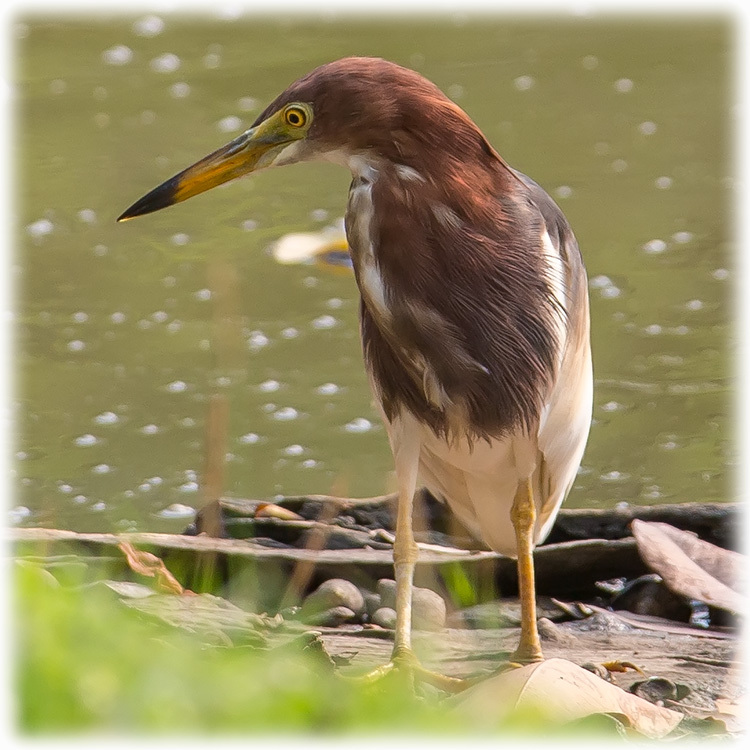 And I never managed to get the Chinese Pond Heron on picture. 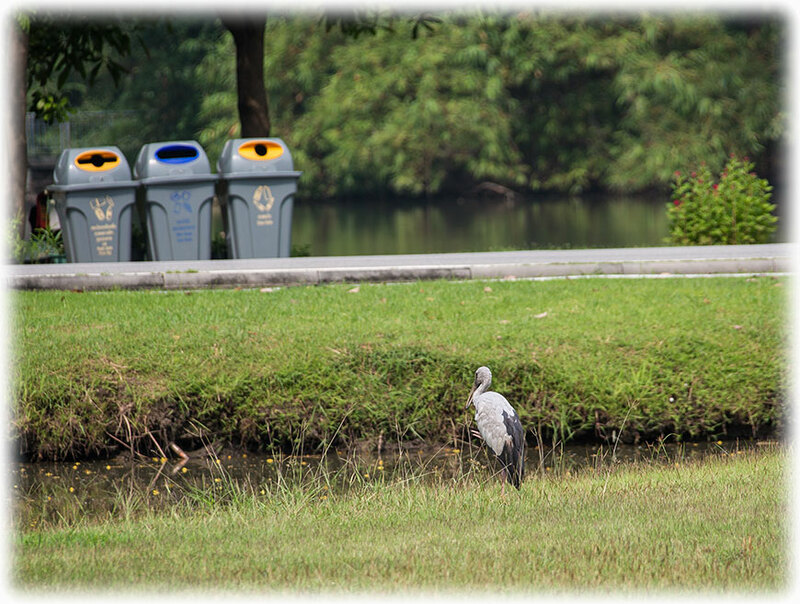 I was scanning the water for Pond Herons while walking back towards the bridge on the Suan Rot Fai side of the water. 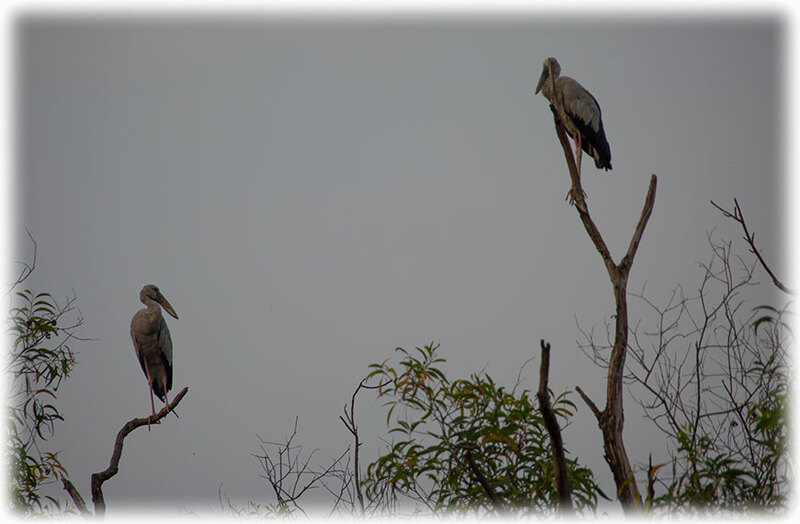 Could not see any herons at the water but many of them took off from the trees when I approached. 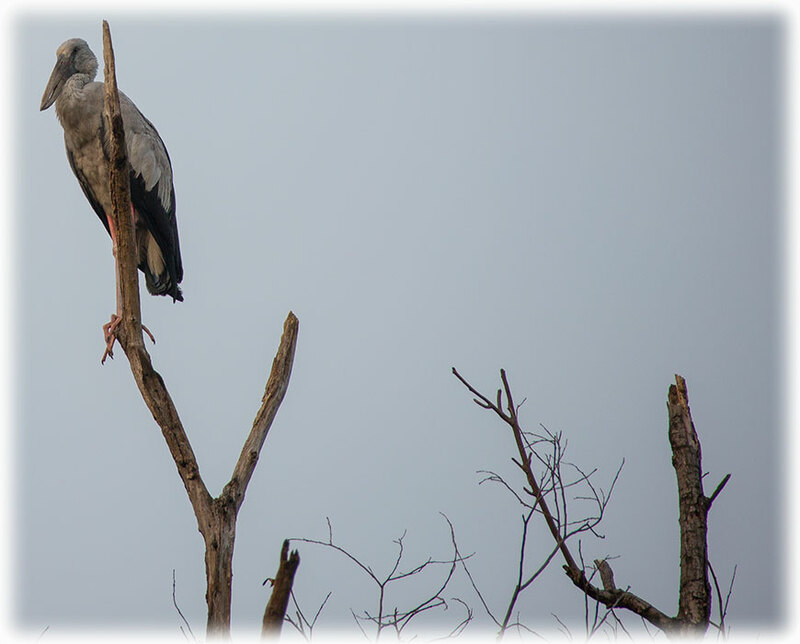 Herons in the trees, breeding season is here. 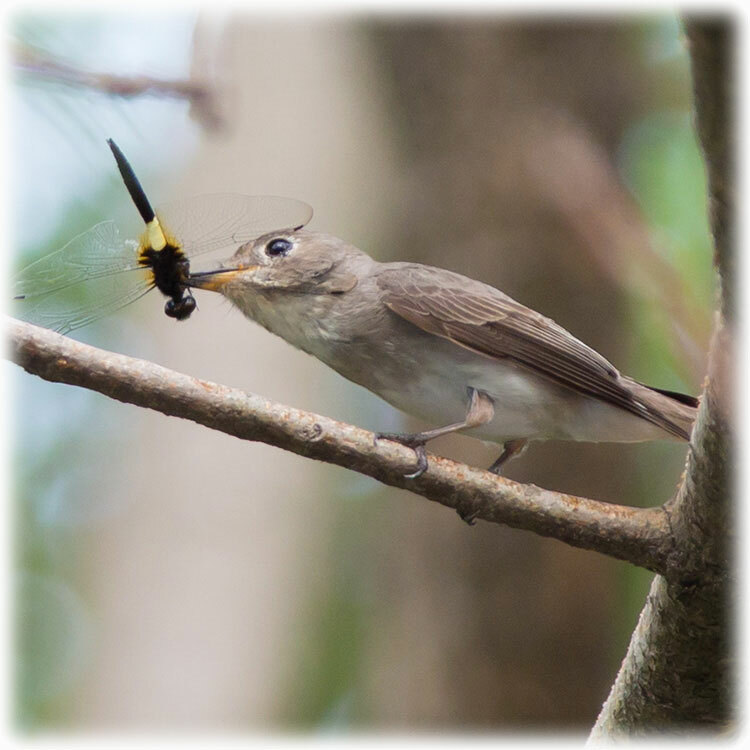 No sign of the Green-billed Malkoha at the bridge, but there was an Asian Brown Flycatcher. 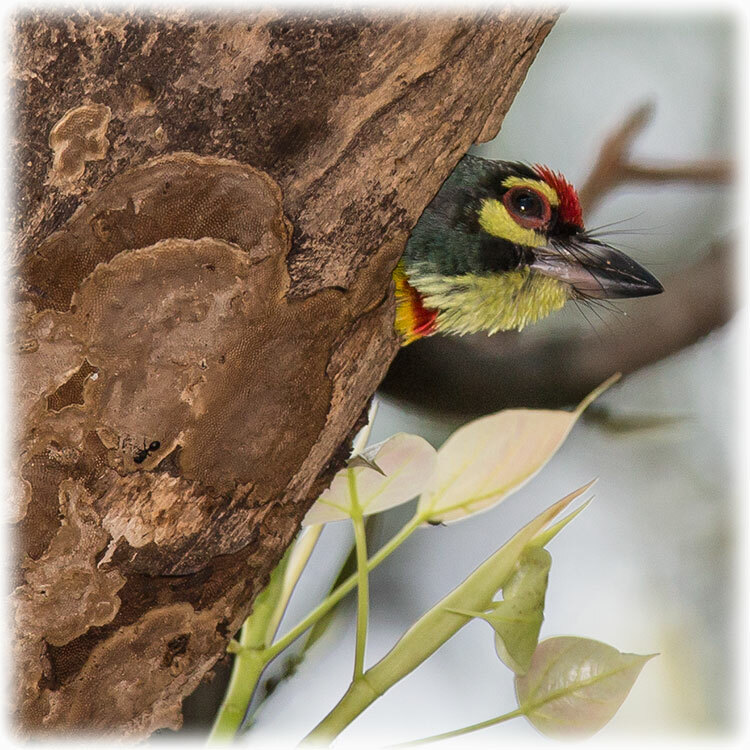 And there was, of course, Asian Koels and another Cuckoo. Or at least looking like a cuckoo but I never got any pictures. 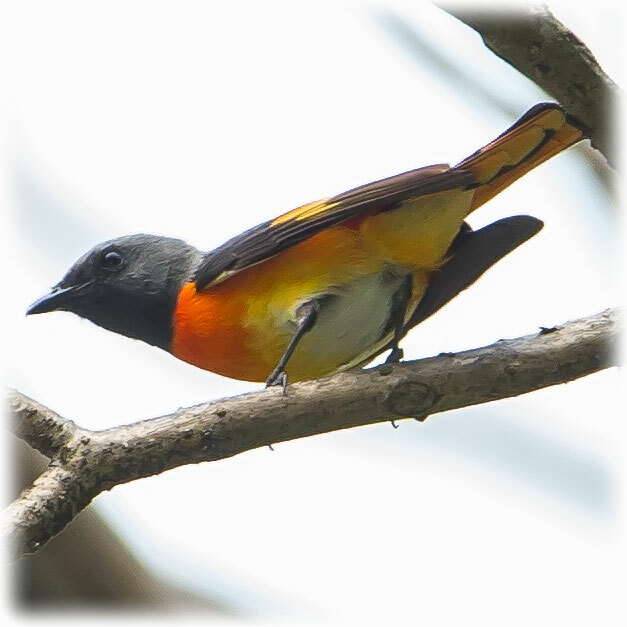 And I never got a picture of the Black-napped Oriole. 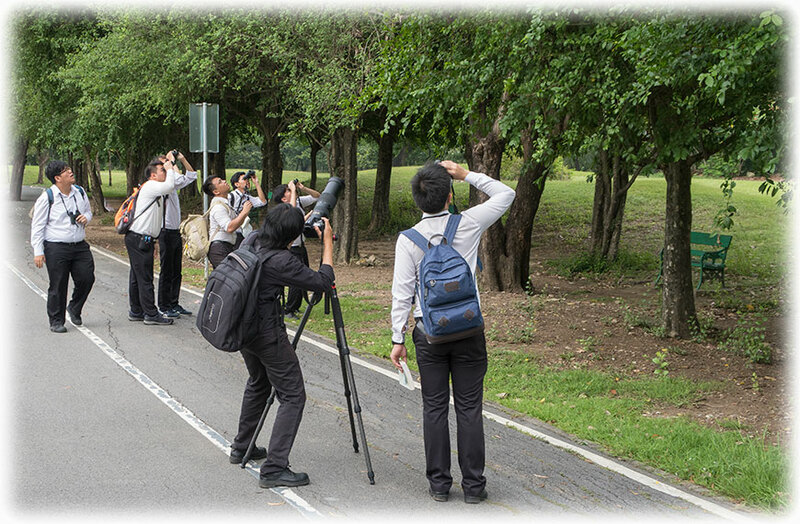 There was a school class looking for birds. They asked if I had seen any birds. I took them across the park to see the owl from this morning. They were very happy and when the owl took off I took them to the “hole” in the tree to see the other owl. 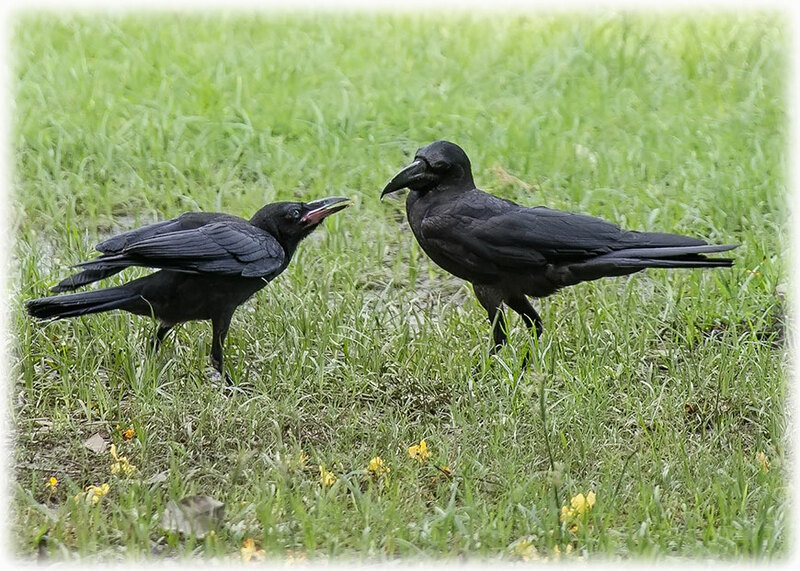 So I look at the head and these two crows have quite a flat head so I put them down as Slender-billed Crow. I might be wrong, would not be the first time. 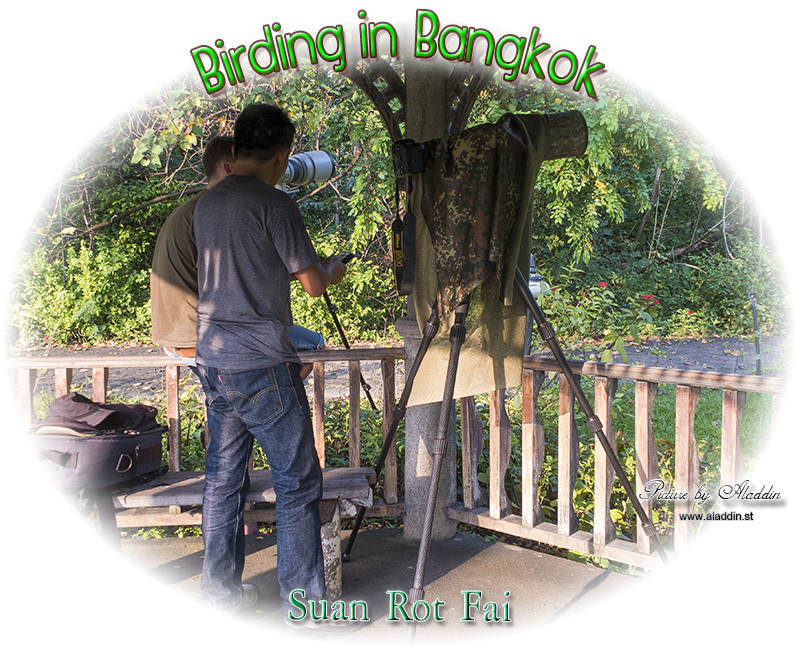 In the taxi back home from Chaiyasit Muay Thai Gym and I feel that I have a cold coming on, my plan is to go for the last birding at Suan Rot Fai tomorrow before going to Nepal. Saturday 24th of March 2018 and I'm in Suan Rot Fai at 7 thirty. 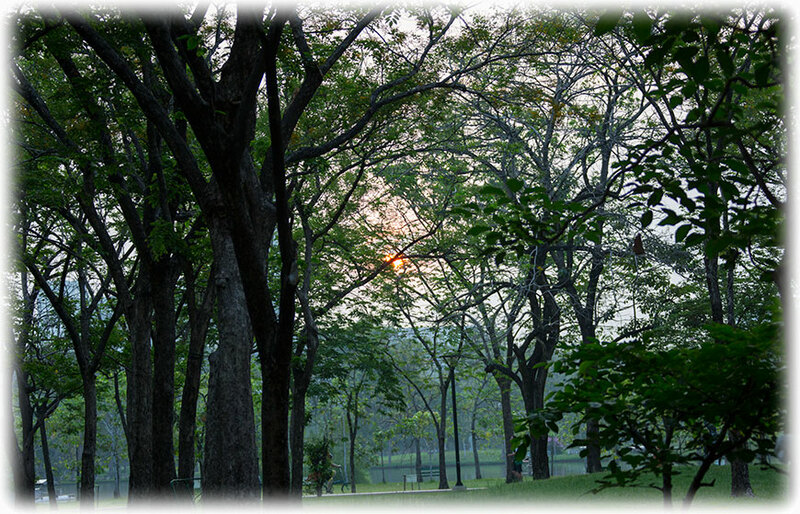 The sun is coming up behind the trees and it looks to be a beautiful morning. 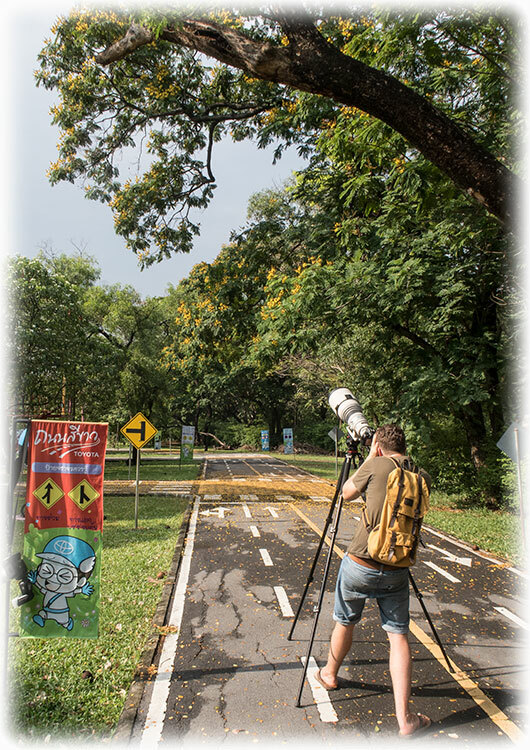 I followed my usual track, but today I was turning left crossing the bridge to the Queen Sirikit Park as I had have plenty of the owls. 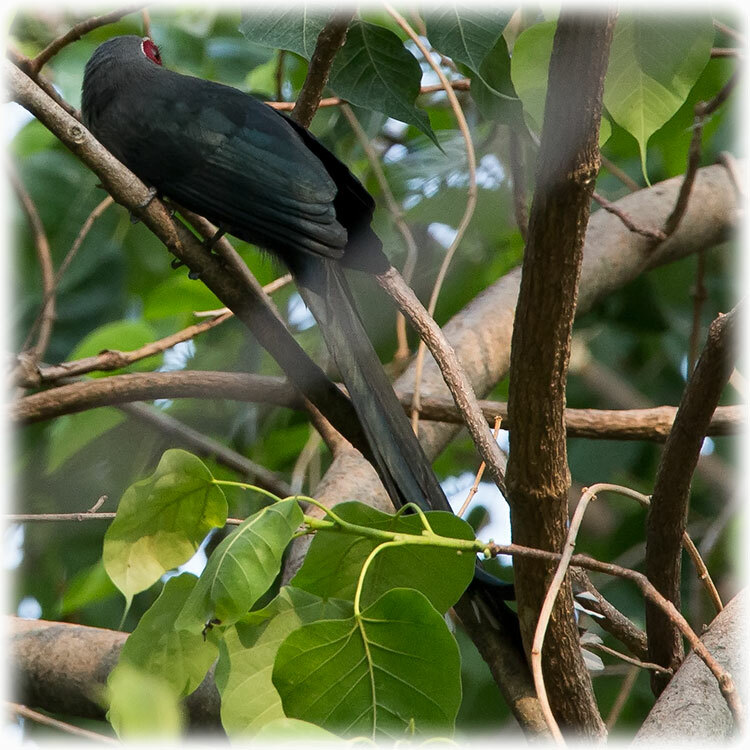 Before crossing the bridge I sat down keeping an eye out for the Green-billed Malkoha. 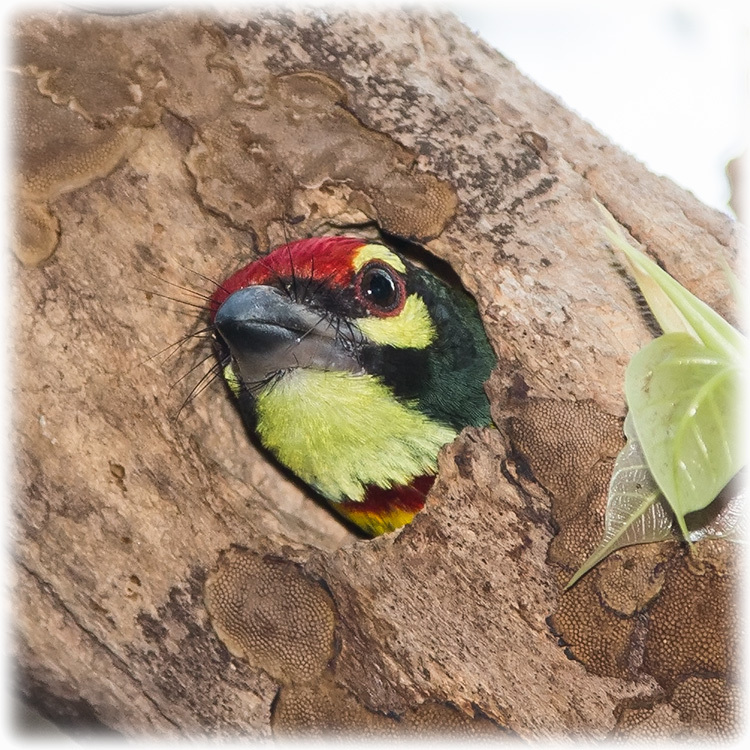 No sign of the Malkoha so I crossed the bridge to go check out the Coppersmith Barbet nest. 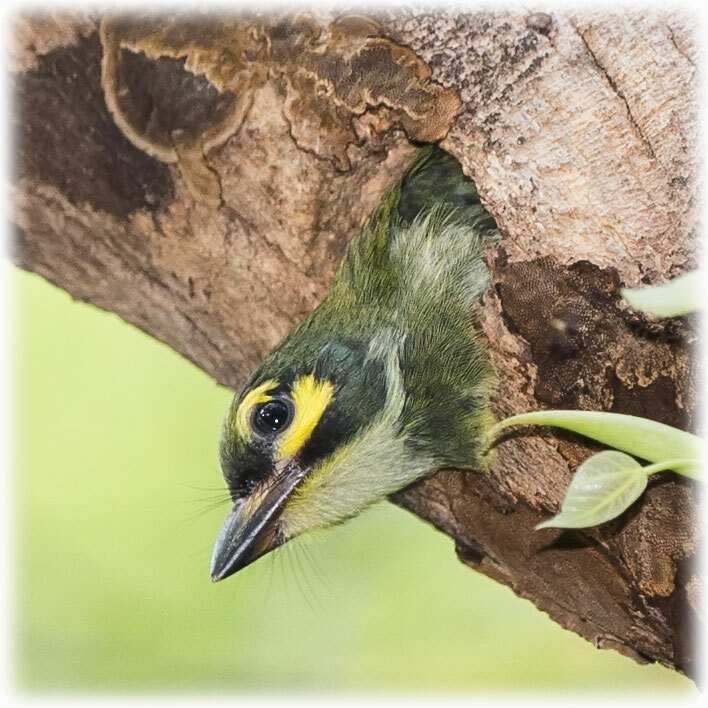 No sign of life yesterday but today I saw a bird sticking out it's head so I satt down with a bottle of water studying the nest. I was hoping for some “Mom and Dad feeding the baby” action. But there wasn't much happening except for the bird staring at me. And I was staring back at the bird. 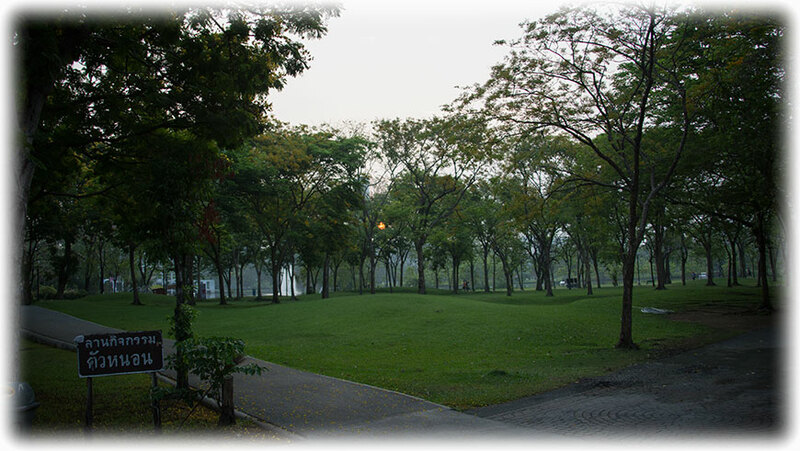 I walk to the bird wave where I cross over to the Suan Rot Fai again. 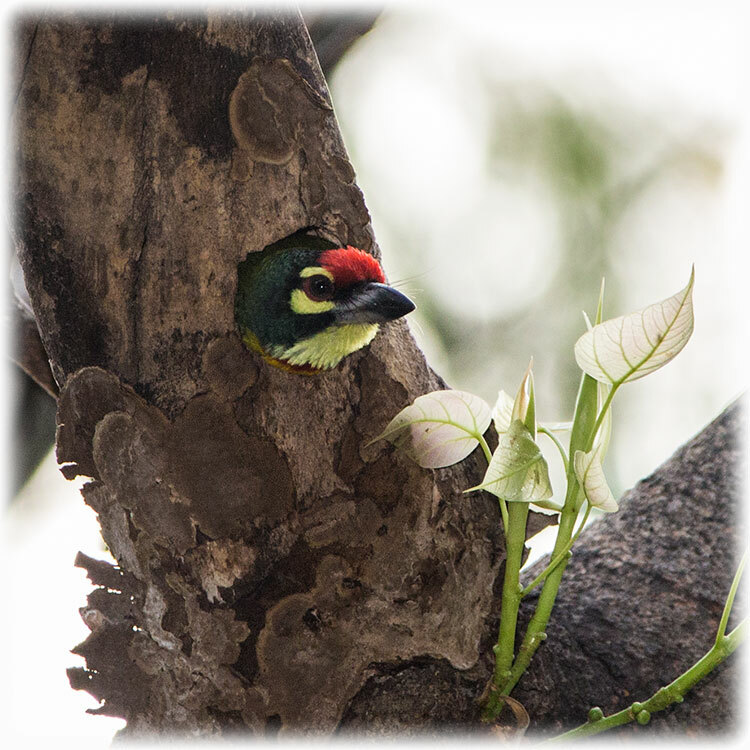 No minivets, but there was some Scarlet-backed Flowerpeckers. 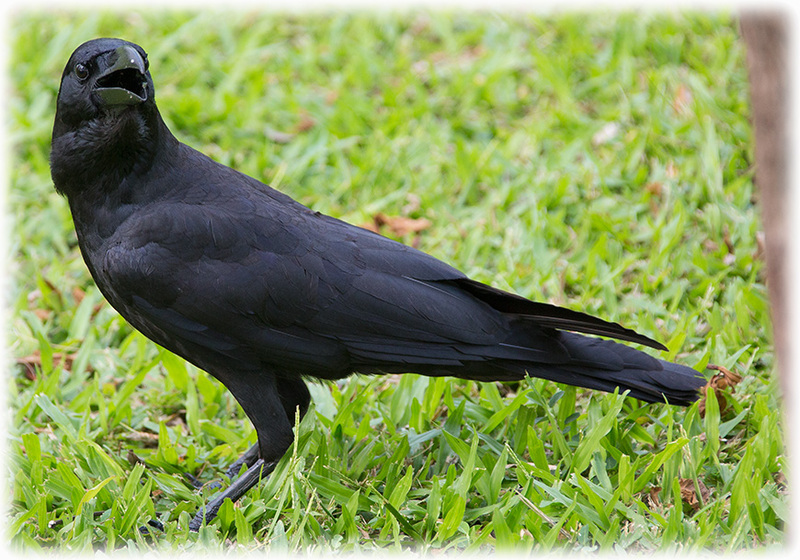 Yesterday it was full of Ashy Drongos, but today nothing. I walk back passing the owl area on my way back to the main gate. 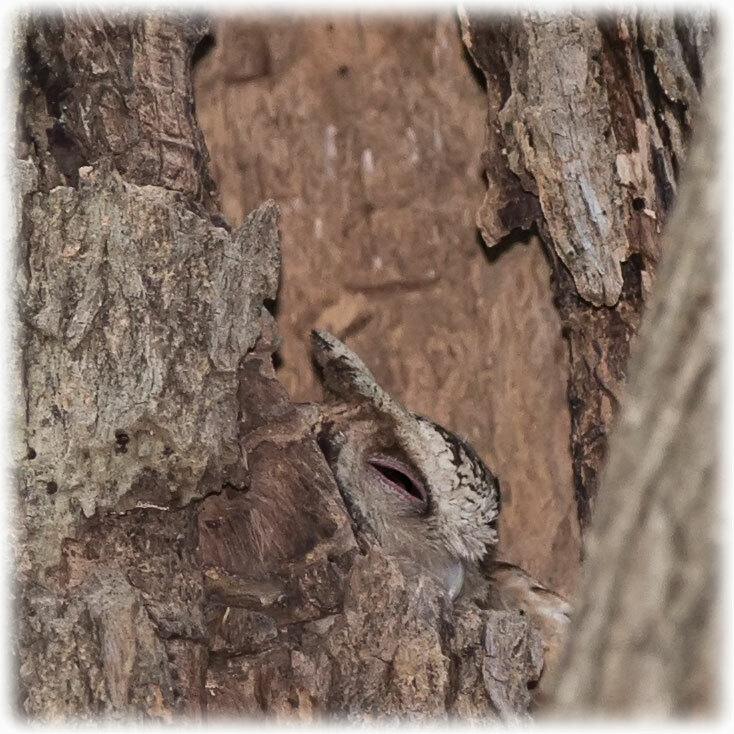 The Scops owl is still in the hole. There is a guy with a big lens and we chat and exchange “birding tips” before I continue. 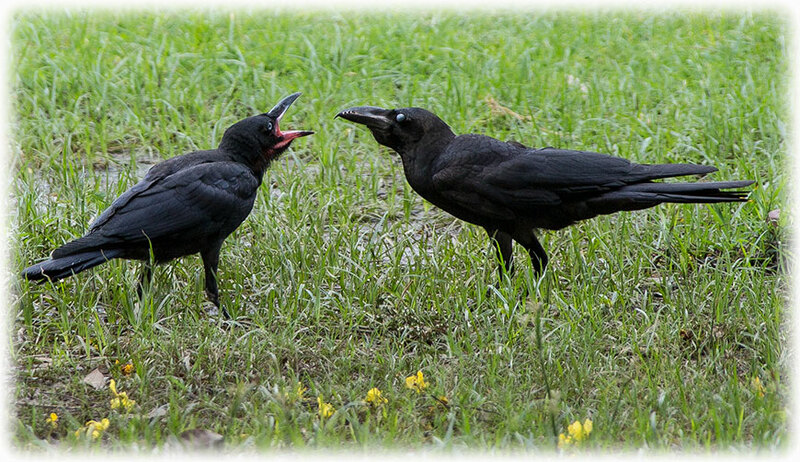 I ran in the a crow and I put it down as a Slender-billed Crow. 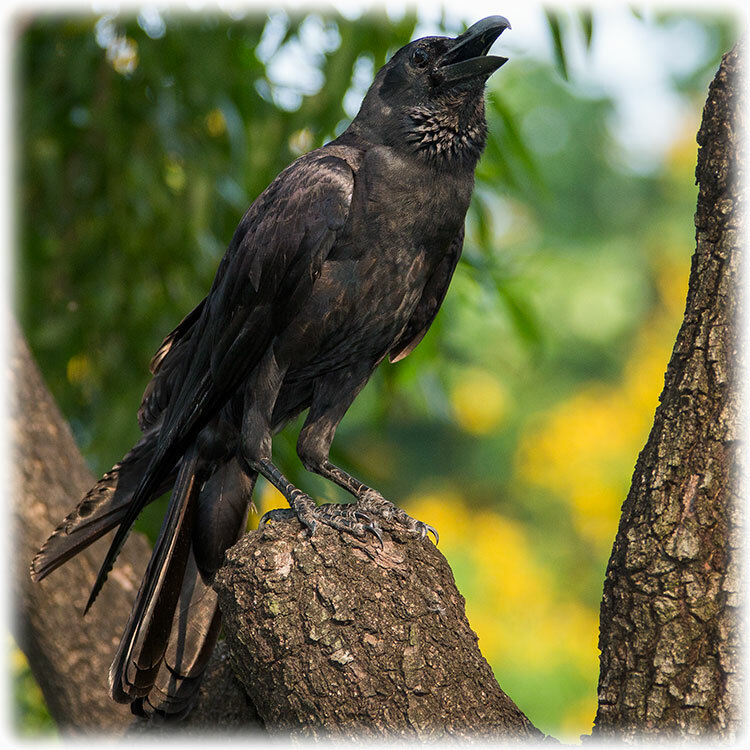 And the crow was just sitting there, otherwise they fly away. So I took the opportunity to make a video. I turn right to come down to the pond where I used to see Blue-tailed Bee-eaters, I have not seen them for a very long time now. 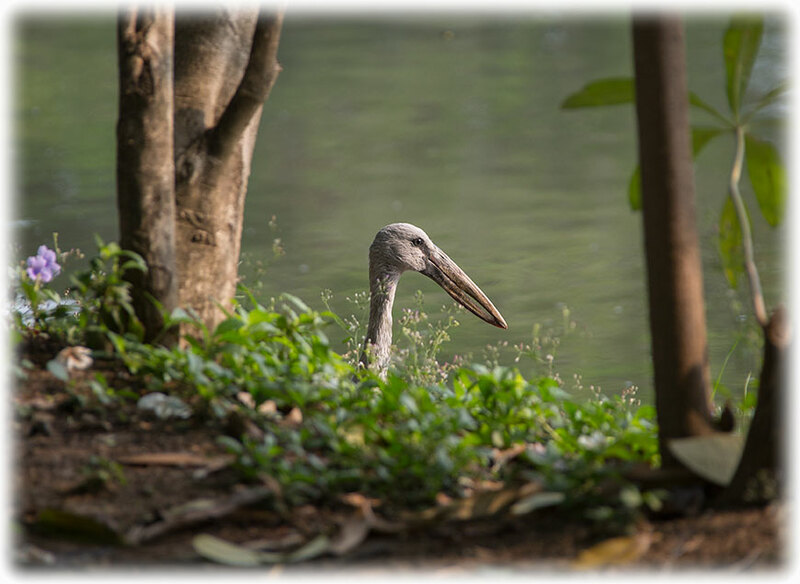 I walk along the path and I run in to yet another Asian Openbill Stork. 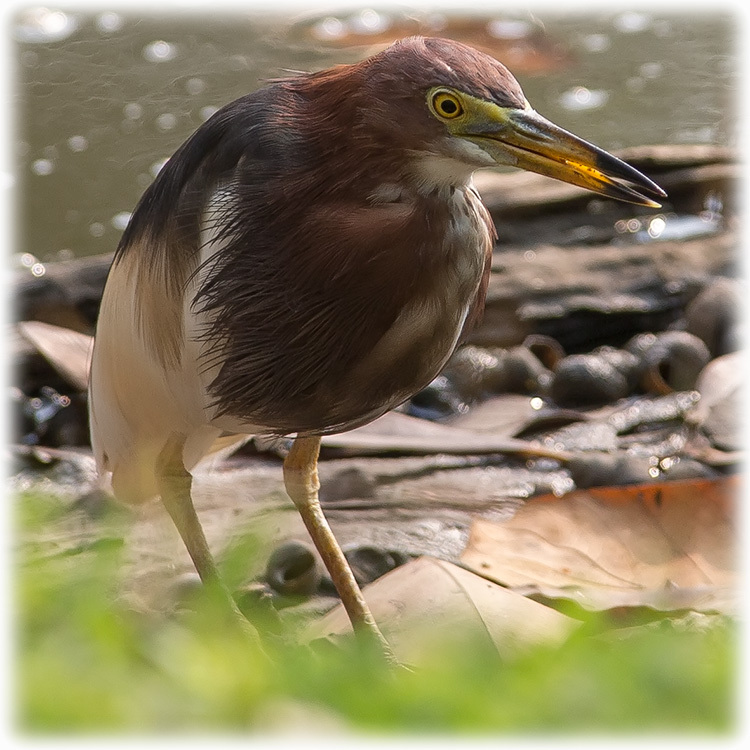 And while I take pictures I discovered a Chinese Pond Heron. Just the heron I have tried to get on pictures. 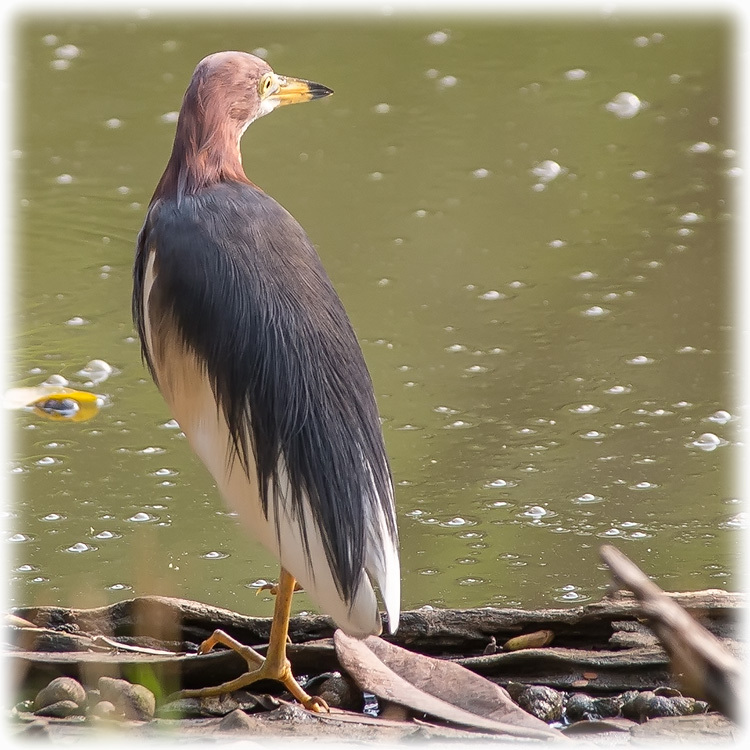 In full breeding plumage and I have no pictures of the Chinese Pond Heron in breeding plumage. 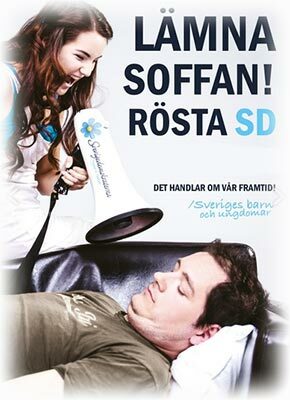 Well, I have one, but not a very good one. 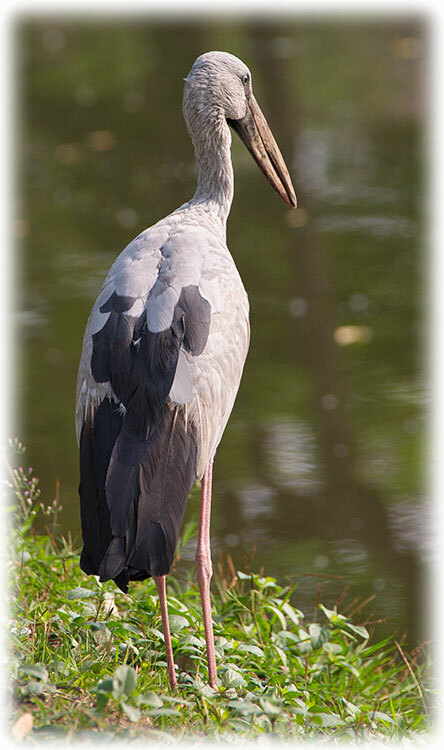 I still working on my page, identifying egrets and herons so I need pictures. And I have learnt a lot about identifying the Great and Intermediate Egret. More pictures is needed, and I learn a lot in the progress. 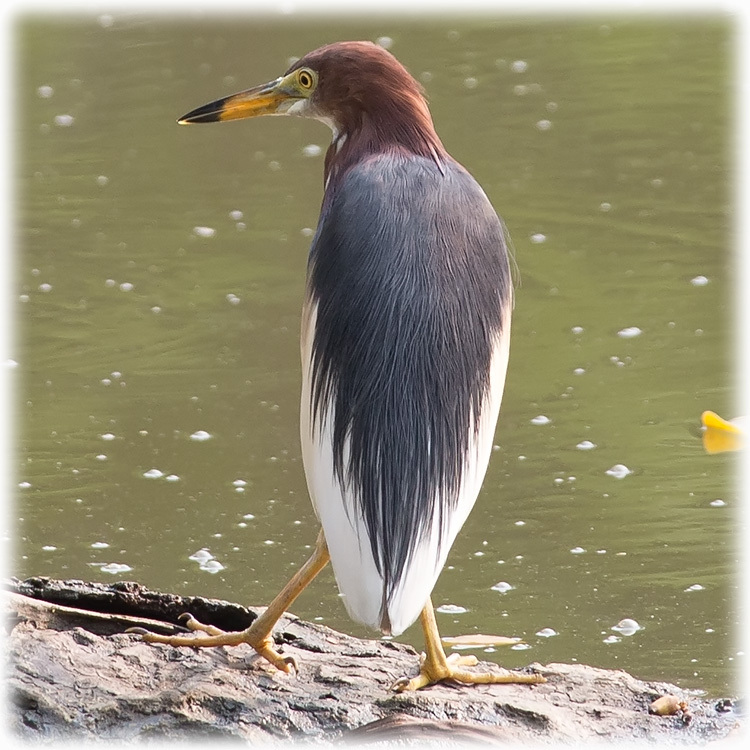 The bird I put down as the Great Egret in Gir, India was actually an Intermediate Egret. Easy to see when you know how to tell the difference, but they look almost exactly the same. But when my pahe is ready it will be easy for you to tell them apart as well. 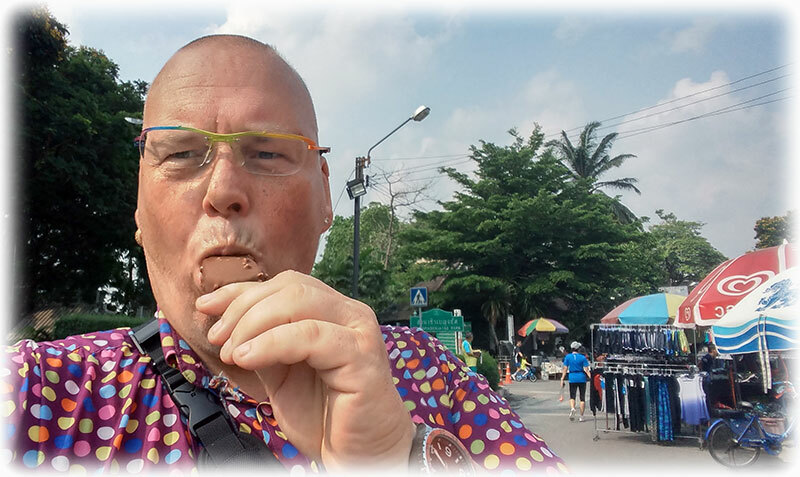 Back at the main gate and I buy an ice cream. A taxi arrives and a girld steps out. - You want the taxi? She warned me that it was a bullsh*t driver. OK, so I didn't take the taxi and I had to walk all the way to Lar Prao before I found a taxi. 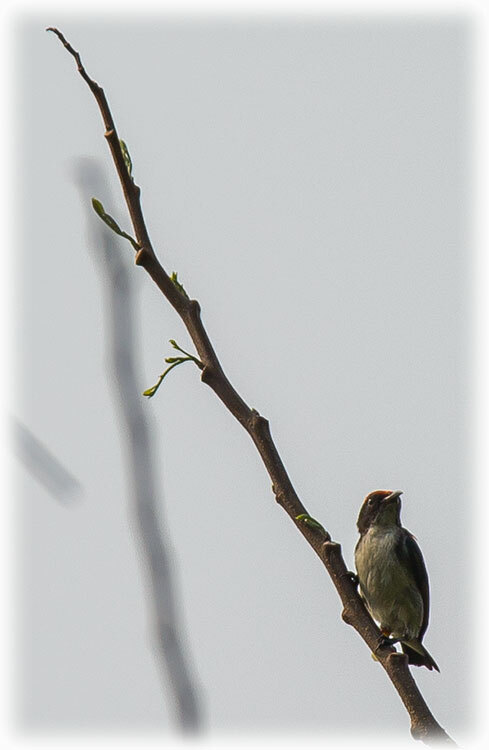 I passed a Scarlet-backed Flowerpecker on the way down the road. It was hot and there was alot of people coming to Suan Rot Fai and the traffic was at a stand still. But I managed to get a taxi even though it took quite some time. Id you want to find out if I find any tigers in Nepal youjust have to click HERE. Off early tomorrow morning for my flight to Nepal.